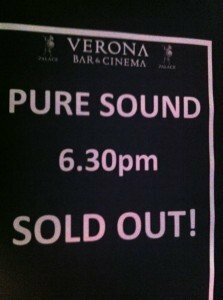 The Sydney screening of Pure Sound – The Gyuto Monks of Tibet at the Palace Verona played to another full house. This matches those in Melbourne, Adelaide, Lismore, Perth and Hobart. The TV hour documentary gives a behind the scenes insight into the lives of the Gyuto monks at their Dharamsala monastery. It has now sold out 11 of its 12 sessions. The odd one out was the extra screening at Cinema Nova – it was 3/4 full.